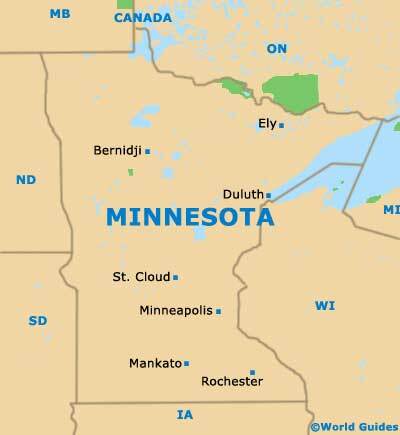 The city of Minneapolis can be found on the southeastern side of the state of Minnesota, within Hennepin County and close to the border with Wisconsin. 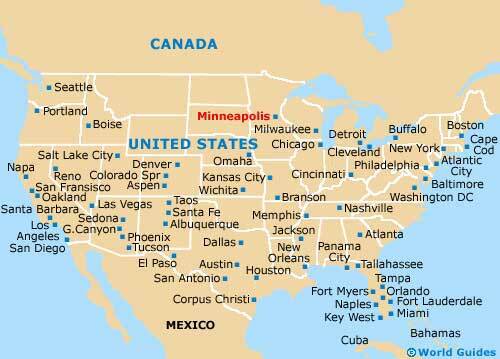 Minneapolis is actually the state's biggest city, although it is the twin city of Saint Paul which holds the prestigious title of state capital. 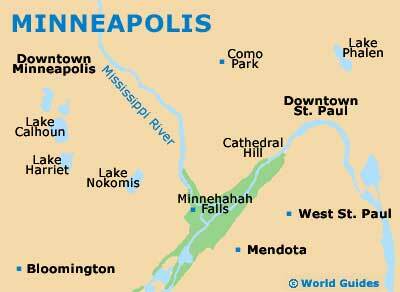 Both cities reside in the Greater Minneapolis St. Paul area, where there are a number of different dialling codes for phones. If you have a rental car and are planning to drive to St. Paul, you will simply need to follow the US-52 / Interstate I-94 in an easterly direction. While maps of Minneapolis may be useful for journeys outside of the city, finding your way around the downtown district rarely presents any problems. The Mississippi River itself provides a useful boundary and is a good point of reference, as are other local landmarks such as the Central Library, the Government Plaza, the City Hall, the Grain Exchange shopping center and the Hubert H. Humphrey Metrodome, next to the First Covenant Church. Lying on the northern side of downtown Minneapolis is the Riverfront District, where the St. Anthony Falls Heritage Trail comes highly recommended. This trail stretches for roughly 2 miles / 3 km and will take you past some interesting sights, with information being provided along the way by strategically placed placards. There are also some great river views to savor here. To the west of downtown Minneapolis is the Walker Art Center and the city's famed Sculpture Garden. The Warehouse District is situated to the northwest, while across the river and to the northeast is the aptly named Northeast District, together with Old St. Anthony and Dinkytown. Directly southeast and linked by the Washington Avenue SE is the Weisman Art Museum and the University of Minnesota, which ranks amongst the largest university campuses in the whole of the United States, with its 50,000+ students.